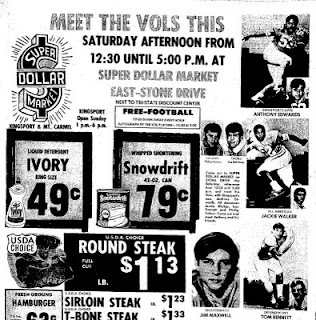 Phillip Fulmer came to Kingsport in the winter of 1972 to play in a charity basketball game and to sign a few autographs at Super Dollar. 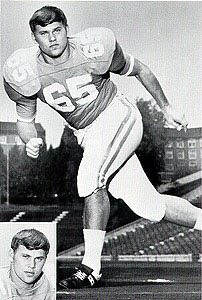 This is his program photo from that football season at UT. 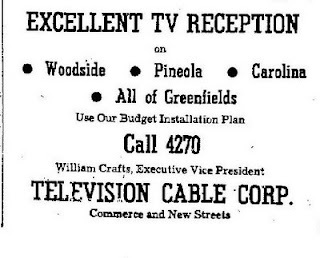 First ad for cable on September 8, 1952. 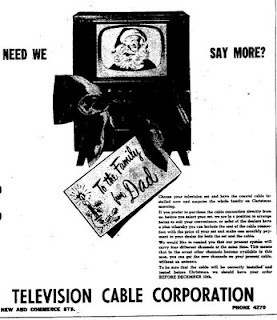 Ad from November 16, 1952. 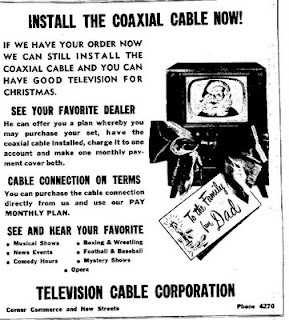 Ad from December 12, 1952. Dobyns-Bennett principals kept a master list of graduates in a Principal's Book from 1919 to 1966. Here are four pages from that book, which now resides in Principal Earl Lovelace's office. The book ended in 1966 with the end of the tenure of Dr. Elery Lay, pictured above from the 1965 yearbook. 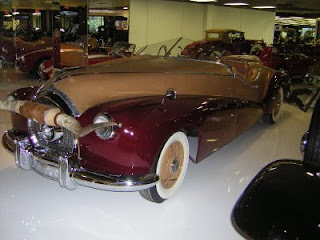 Jude’ Lee Routh, the archivist for the John O’Quinn Collection of classic cars in Houston, Texas, sent me a photo of the J 462 Duesenberg that Tom Mix drove into Kingsport in 1934. Check out those steer horns. Eight-year-old Bruce Haney was climbing down from Santa's lap at the 1955 Eastman Christmas Party, the social event of the year for grade-schoolers in the '50s, when Santa began calling to his father. "Hey, Usif! Usif Haney! What do you want for Christmas?" Little Bruce was astounded. "I remember thinking, ‘Wow, Santa Claus knows my dad.' And I also remember thinking, ‘Santa Claus sure sounds a lot like J.D. Wininger.'" Little boys and little girls all over Kingsport grew up with that same secret: Santa sounds a lot like J.D. Wininger. From the Eastman Christmas party to the Palmer Center holiday celebration to the Bethel Presbyterian Church Christmas party to Christmas Eve at Holston Valley Community Hospital, Santa had the same resonant voice as the man who coached the Civitan Midget League baseball team, who led Boy Scout Troop 48 and refereed high school basketball games. For generations of Kingsport kids, those who grew up between 1944 and 1988, Santa sounded a lot like J.D. Wininger. J.D. Wininger was a strapping man of 30 with a full head of black hair when he first played the role of Santa at the 1944 Tennessee Eastman Recreation Club Christmas Party, bouncing a thousand or so kids on his knee that holiday. By the time he retired from the Eastman Party part 44 years later, he had grown into the job with white hair and a bowlful-of-jelly belly of his own. And he had bounced tens of thousands of Kingsport kids on his knee. He was Santa because he got into the Santa suit early. A Santa sighting was a rare occurrence in the '40s and '50s. There was the annual Santa Parade the day after Thanksgiving, when Santa would ride a float down Broad Street, then descend and amble into W.B. Greene's for a two-hour session in the department store's downstairs Toyland. But none of the other stores had Santas - or at least they didn't advertise the fact in the paper. Santa wasn't a necessity for the local department stores. They closed at 5:30. They only stayed open on Parade Friday till 8 p.m. to accommodate parade goers. The rest of the holiday season, it was business as usual: 8:30 a.m. to 5:30 p.m., except Wednesday when they closed at noon. When a kid needed to tell Santa what he wanted for Christmas, he wrote him a letter. Or if he were a lucky Eastman kid, he sat on his knee at the annual company Christmas party. And the man behind that beard was J.D. Wininger. "He loved playing Santa," recalls his daughter Glenda Wininger Denny, who now lives in Sumter, S.C.
"And we used to love it when he put on the suit," adds her sister Peggy Peterson, now a resident of Sewanee, Tenn. "I especially used to love it when mom would drive him to a party. Glenda and I would ride in the back seat and people would look in the car and point, ‘Look there's Santa.' I'd think, ‘Aren't we cool, we're in the car with Santa.'" The 1955 Eastman party, when Bruce Haney first connected Santa and J.D. Wininger, drew a crowd of 6,044, according to the TEC News, which didn't offer a breakdown of kids to adults. Assuming every kid had a couple of parents and a younger sibling, that would mean some 3,022 sat on Santa's knee that day. That's a lot of wear and tear on Santa's knee. "He was always really tired after the party," says Peggy. "But happy," notes Glenda, who has decided that this column will be the place to reveal one of Santa's secrets. "Want to know how he knew every child's name and what the child wanted before he ever got up on Santa's knee? He had an earpiece in his ear and the person that was the elf would talk to the child so that when he got to Santa, Dad knew his name and what he wanted. It was high tech before high tech." Not to be outdone, Peggy is ready to spill the beans - jellybeans, of course - on another Santa secret. "At some parties, Santa would bring Rudolph, which was my brother Ty and one of his friends. Ty would be either the front end or the rear depending on what kind of mood he was in. Santa would ask Rudolph how old the child was. And he would pat Rudolph's rear the number of years so Ty would know how many times to stamp his hoof." On Christmas Eve, Wininger would visit every room at Holston Valley Community Hospital, every patient, to bring them some holiday cheer. "It took several hours to do this," recalls Glenda. "In later years my husband Charlie would be his reindeer. Charlie said Dad tried to explain what it was like being inside the suit and seeing the joy on people's faces." The Santa who sounded like J.D. Wininger so inspired his daughter's husband that years later the son-in-law bought a Santa suit of his own. "Now Charlie visits preschools and elderly friends and he understands the magic inside the suit." Others have filled Kingsport's Santa suit over the years. Frank Brogden just wound up a 20-year run as the Santa Train's jolly old St. Nick. Even J.D. Wininger couldn't be Santa to all kids. "He and another man would alternate, an hour each, at the Eastman party," recalls Glenda, who says that her father would want to make sure that all the other Santa's got credit. J.D. Wininger died in 1990, only two years after turning in his Santa suit, literally. "He returned it to Eastman when he retired from that part of his life," says Glenda. "It actually belonged to Eastman and it was far superior to the suits you see in the stores." Most every kid in Kingsport knew J.D. Wininger and knew his voice and knew that Santa sounded a lot like J.D. Wininger, but still they believed. Daughter Glenda says she watched him put on the suit and went with him in the car and it never for one minute diminished her certainty that there was a Santa. "I've always believed in Santa Claus because I lived with him forever." It was lunchtime at the Jan-Mar Restaurant, and all the booths along the right wall were taken. The counter was filling up, so half a dozen late arrivals piled in the new set of tables up front. But the first booth along the left wall was empty. It was Wednesday morning. At the upper end of Broad Street the church bells were tolling for the late Jimmy Quillen. At the lower end Congressman Quillen's Booth at the Jan-Mar sat empty. Jimmy Quillen, Kingsport's First Citizen, was being eulogized at First Broad Street United Methodist Church, a funeral turnout the likes of which hadn't been seen in town since J. Fred Johnson passed away in the '40s. Church Circle was abuzz. Things were simpler at the Jan-Mar. There was no black bunting over the back booth, no memorial wreath. The waitresses were scurrying around, taking orders and worrying over next week's schedule. Things seemed normal. Except at his booth, with the wooden plaque "Congressman Quillen's Booth" on the wall above it. No one even approached the seat. "One girl sat down there at breakfast, but she moved over pretty quickly," said waitress Anissa Amyx. There are a dozen East Tennessee landmarks named for the late congressman: a medical school, a highway, and a courthouse among them. But nothing that he used more than his booth at the Jan-Mar. Jan-Mar owner Bill Green said Quillen started frequenting the restaurant early on. "I was just 9 years old when Mom and Dad opened up in '53, and I can remember him coming in here then." The Jan-Mar became one of his haunts. And the back booth became his spot. He sat in the outside seat on the back side, where he could survey all the dining room. In 1990, on the occasion of the congressman's 74th birthday, his friend Lon Boyd asked Green if he could put up a plaque claiming the booth as Quillen's own. It was an easy answer. "And he said, ‘Now, Bill, don't you save that booth all the time. You'll need that booth at lunch. I said, ‘Don't you worry.'" It was the congressman's booth at breakfast, but later in the day an assortment of diners would move in. No Democrats of course. Green recalled a pair of staunch Democratic sisters who would stand and wait before they would sit in Jimmy Quillen's booth. Congressman Quillen's Booth got a workout over the years. "He was in here all the time until Joe died," said Amyx, Green's daughter, who's been waiting tables at the restaurant for the last 15 years. "After Joe died, I think it reminded him of Joe." Joe was Quillen's great friend Joe Young, longtime jeweler at Dobyns-Taylor, who opened his own jewelry shop in the old hardware store location next to the Jan-Mar in 1985. "He converted Joe from a Democrat to a Republican," remembered Green. Young died in the spring of 2002. And the congressman's visits slowed to a trickle. Deteriorating health also limited the congressman's ability to get to town as much. But before he got sick, the Jan-Mar was a second home. There's a photo montage of those days above his booth. "Motley Bunch" it's labeled, appropriately, and there are snapshots of the congressman and his cronies clowning around in silly green St. Patrick's Day hats. "They were a sight," said Amyx. "They'd flip a coin to see who was going to pay." It was traditional for the congressman to dine at the Jan-Mar on his birthday. But Green, knowing Quillen's poor health, worried that maybe he wouldn't make it last January. "I called him the day before," said Green. "I said, ‘Mr. Quillen, I don't know if I'll be the first or not, but I'd like to say happy birthday.' He said, ‘My birthday's not until tomorrow.' I said, ‘I know that.' He started telling me how he hadn't been feeling good. I told him, ‘Everybody's expecting you to be down here on your birthday.' He perked right up and said, ‘I'll be there.'" And he was, propped up in his booth, eating his birthday meal. Waitress Eloise Thomas said, "He got his regular, bacon and egg sandwich with everything." Then he was absent again for a stretch. But he missed the Jan-Mar, and Thomas recalled that he had his driver bring him downtown one day a couple of months ago. "He pulled up out front. He was too sick to come in, so Bill went out and talked to him." As noon approached Wednesday, the funeral procession on the upper end of Broad Street began its march down West Sullivan to Oak Hill Cemetery. On the lower end, Eloise Thomas set the table in Congressman Quillen's Booth. Three sets of silverware, three menus. A group of regulars would be arriving for lunch, and they always sat in the congressman's booth. "Those ladies have been coming in a long time," said Green. "Mother used to set that table for them long before Lon Boyd put up the congressman's plaque." The time of mourning was passed. It was noon, and the regular ladies lunch group would be sitting in the first booth on the left. But it was still Jimmy Quillen's booth. The plaque on the wall said so. 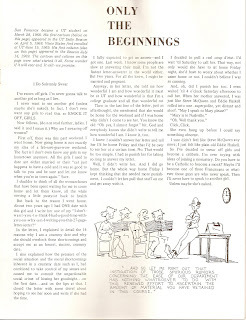 And this was my first ever column, published in the UT Daily Beacon 1969, when I was 21 years old.